Back pain is a common and often debilitating problem for people of all ages. 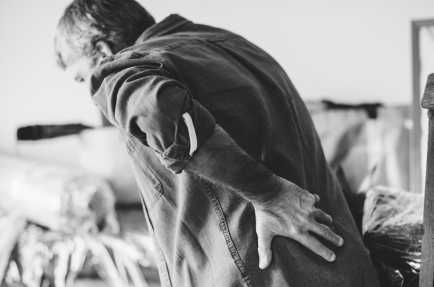 Experts estimate that over 80% of people will experience back pain at some point in their lives. Unfortunately, people who have chronic pain get significantly less sleep each night than those who are pain-free. Why is this a problem? Because sleep plays a key role in our mental health, physical well-being, and quality of life. If you’re having trouble sleeping due to back pain, these tips are for you. Did you know that some foods can actually reduce muscle-, bone-, and joint-related pains? Many fruits and veggies can help you get a handle on back pain thanks to their joint-supporting vitamins and anti-inflammatory properties. For example, cruciferous vegetables like kale, broccoli, and cauliflower are densely packed with fiber and calcium to keep your bones strong. Fruits like pineapples and oranges are high in vitamin C, which helps your body produce collagen to strengthen your joints and improve muscle flexibility, while ginger is particularly great at fighting inflammation. Try to fit some of these foods into your diet to support your back health from the inside. According to Healthline, some sleeping positions are better for your back than others. Sleeping on your back is the best way to support spinal health. If you do this, place a pillow under your knees to take pressure off your lower back. Sleeping on your side with a pillow between your knees is the next best option if back sleeping is uncomfortable. The pillow will align your hips and pelvis to ensure your spine remains straight during the night. If you like to sleep on your stomach, try putting a pillow under your pelvis. This relieves pressure from your back and can be particularly helpful for people with degenerative disc disease. Simply stretching your back before bed is a great way to keep your spine flexible and back muscles strong. Try out a few simple yoga poses before bed, and see how you feel the next morning. For example, the cat-cow yoga stretch is a great way to relieve stiffness and keep your spine mobile. Don’t forget to stretch your legs, too—tight hamstrings can pull on your back muscles during lifting and bending. Just like stretching, getting your body moving is an excellent way to gently loosen up the back muscles. Plus, exercise causes the brain to release pain-reducing hormones. Although other forms of exercise can also help reduce back pain, walking is often recommended, because it is low-impact and easy for almost anyone to get started with. Typically, people with acute lower back pain can benefit from 10 to 30 minutes of walking at least once per day. While walking, pay attention to your posture by keeping your back straight and your head facing forward. According to SpineUniverse, well-developed abdominal muscles can promote proper spine alignment while protecting your back from injury. Engage in core-strengthening exercises to reduce strain on your back. Aside from stretching, some good ways to do this include elbow planks, ab crunches, and push-ups. When you have back pain, old and poor-quality mattresses are your worst enemy. If your pain is worst in the morning, particularly after waking, it’s time to take a good look at your mattress and consider investing in something more comfortable and supportive. Check your bed for visible sagging spots and areas that feel uneven. In general, sleep experts recommend replacing your mattress every 7 to 10 years. Suffering from back pain day and night can feel like an endless nightmare. Don’t let your back pain keep you from getting the solid rest that your body and mind need to function optimally. Try out these wellness tips to reduce back pain and improve your sleep while supporting your general health at the same time.